News and features on travel, cycling, tech and London. 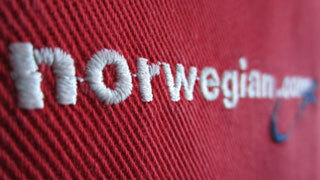 Norwegian Air Shuttle was the first airline in Europe to offer in-flight wi-fi. They began installing the technology in January 2011 and aim to complete the roll-out across their fleet by the end of this year. I have always wanted to give this remarkable service a go and had the perfect opportunity yesterday, as my flight from Oslo back to London coincided exactly with the first game of Euro 2012. 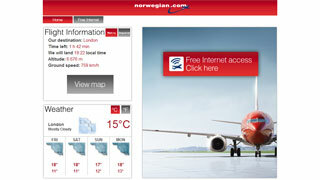 Wireless internet access is currently available on all of Norwegian’s Boeing 737-800 aircraft. 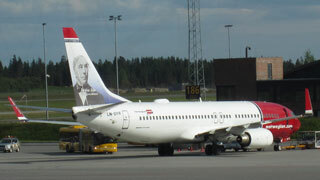 Some of these, including the one I flew on, have a promotional livery. 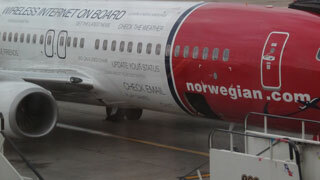 The words “wireless internet on board” were painted across the side of the airplane, along with all sorts of new in-flight possibilities, such as “get the latest news”, “learn a new language”, “pay bills” and “watch cute cat videos”. Perplexingly, the cabin crew made all the usual announcements before take-off, including a reminder to keep all devices with radio transmitters off throughout the flight. However, a further announcement after take-off informed us that the wi-fi had been enabled, although this one was only made in Norwegian. Happily, I picked this up despite my very limited Norwegian. We had reached cruising altitude, the “fasten seatbelt” sign was off and internet was now enabled. All around me, laptops, netbooks, tablets and smart phones were being pulled out and turned on. I fired up my computer in anticipation of the many cat videos I would watch over the next 90 minutes or so. Sure enough, “Norwegian Internet Access” appeared in my list of available networks with a full five bars of signal. I connected without difficulty and opened up my browser. The first page displays live flight stats, as well as the weather forecast at destination and a live flight map. There’s also a link to connect to the wider internet. In future, I suspect this will end up behind a pay wall (more on that later) but, for now, it’s all free. I was able to load the BBC Sport website remarkably fast, with text and images displaying within about 20 seconds. Half an hour in to Euro 2012, it was Poland 1, Greece 0. The BBC’s live text commentary was updating as normal. It seemed like it really would be possible to follow this game from the air. 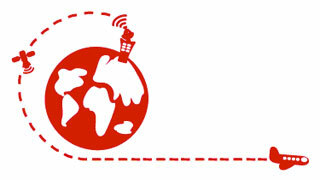 Due to copyright constraints, the online video stream was blocked outside of the UK. But even if this had not been the case, the connection speed did not seem up to delivering video content. I would have to give those cute cat videos a miss. However, the rolling text commentary was perfectly adequate, describing a thrilling game in which Greece missed a penalty and both teams ended with just ten men. It was a 1-1 draw at full time. Having read the news, checked my e-mail, tweeted a message and even sent a text (from my mobile operator’s web portal), I may have got a little too ambitious. The connection slowed right down and I received timeout errors when trying to access even the most basic content. This may have been due to mild turbulence throughout the flight but I suspect it was mainly a result of more passengers connecting their devices to the wi-fi network. And that is the key problem with the whole concept: The more popular the service becomes, the slower the service gets for everyone. Presumably, the airline caps individual usage (they state on their website that they “will enforce control to make sure that everyone who is online will get a good experience” and “filter inappropriate content as well as voice applications”. But with potential for almost 200 people sharing one satellite internet connection, it doesn’t take much to grind the connection to a halt. I rebooted my laptop and reconnected to the network, just in case there was anything wrong on my side. But, no, the speed remained very low for the remainder of the flight, with pages sometimes taking ten minutes to load. I did belatedly get to read all of the match commentary, just before my battery ran out. 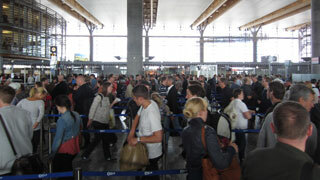 Due to strikes in Norway, I had already been using the airport’s wi-fi for an hour before boarding. There are two wi-fi access points inside the aircraft cabin. These are connected to an antenna mounted on top of the aircraft fuselage (see the first photo). This antenna transmits and receives data via a satellite orbiting the Earth at about 35,000 km. So every web request from inside the aircraft is beamed up to a satellite and then back down to the ground. This means that even in perfect conditions, it takes a minimum of 2 seconds for a reply to be received from the website, about ten times as long as it would on the ground. Norwegian state on their website that they have “chosen to offer this service free of charge in the beginning“. And I guess that they will start charging for the service soon after the rollout is complete across their fleet. After all, they are a budget airline where hold luggage and meals incur extra charges. Having invested huge sums in this technology, they will need to recoup some of this from end users. But, in addition, they’re going to want to curtail the number of people trying to use the service at any one time. It will be interesting to see what pricing structure they eventually adopt.